Have you ever been in an interview and all of a sudden felt lightheaded? Have you experienced fear of losing control when taking part of physical activities? More and more people every day are experiencing anxiety, and some don’t even realize they have anxiety. Humans experience stress which creates anxiety. Anxiety forces people to pay attention to situations. Interesting enough, women are more likely to experience anxiety disorders than men. The disorder is treatable both naturally and with medication. In addition, anxiety is more common than you think. It may be because of the fast-paced Western culture such as social media, work, and family issues. Nonetheless, there are a couple different types of anxiety disorders which will be discussed, and then there are also many natural remedies. Agoraphobia -Fear of going out in public. These people often never leave their home or do anything to avoid traveling outside their home. Generalized Anxiety Disorder -Excessive worry about daily activities. Often people have anxiety about daily responsibilities such as house chores, work, and family obligations. Panic Disorder -Panic disorder is both physical and psychological distress. Some symptoms that might occur are sweating, trembling and shaking, chills, nausea, etc. Phobias -Fear of a specific object or activity that isn’t harmful. Some examples are driving, flying, and snakes. Separation Anxiety Disorder -Fearful or anxious about separation from a close person in your life. Social Anxiety Disorder -Significant anxiety and discomfort about being embarrassed, humiliated and belittled in social gatherings. Some examples are: performing in front of a large crowd and meeting new people at a bar or club. 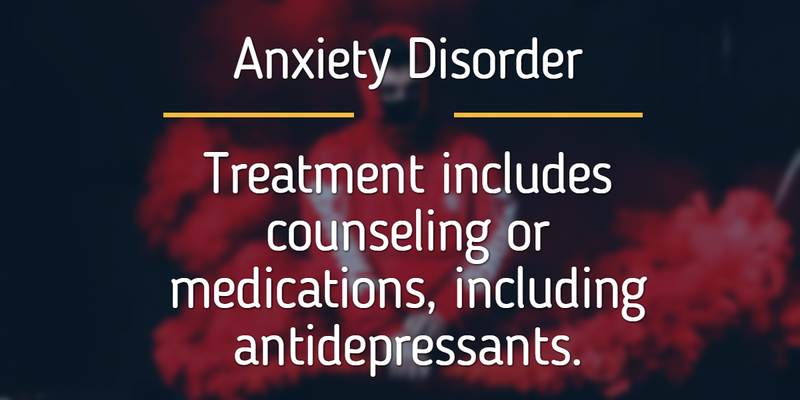 If you have symptoms of any of these anxiety disorders, you should see a doctor in order to find out if there is a physical problem that is causing the anxiety. After deciding on the route to take regarding taking medications or not, there are several natural remedies to help treat anxiety. Chamomile – From China to Latin America, the loose tea leaves are notorious for soothing and calming the mind and soul. For ages, the tea has been known for calming the nerves and helping people sleep at night. Tea is quite popular now, and chamomile is easy to find at any grocery store. Get out your favorite Disney cup, and steep a cup full of chamomile to calm your nerves. Green Tea – There have been countless studies that show that green tea lowers a rising heart rate and blood pressure. To feel the results you’ll have to drink five cups of tea a day. From monks to yoga gurus, green tea is highly regarded as not only physically beneficial but also mentally. Marijuana – In low doses, marijuana has been shown to reduce anxiety. Some users swear by it in order to calm their nerves and reduce anxiety and stress. Most states allow U.S. citizens to attain a marijuana medical card, which is beneficial in the case that you do have anxiety. Indicas might be more beneficial to people who have anxiety than sativas. Medical marijuana may also be a treatment for social anxiety disorder, but please do your research to find which type fits you the best. Exercise – Most people exercise because they want to lose weight. But in fact, there are people who report feeling less stressed after they exercise. Working out is a great antidote to depression and anxiety. If people work out on a consistent basis, it will make them feel healthier both physically and mentally. People should choose an activity they enjoy the most because it will lead to an overall positive attitude. Some exercise activities are Zumba, lifting weights, running, cycling, biking, hiking, dancing, snowboarding, and climbing. Meditation – There are so many apps now that teach the practice of meditation. It is even easier to rent a book at the library to learn more about meditation. What is it? Well, meditation is basically the practice of paying attention and it helps people be in the present moment. Meditation is one of the top ways doctors use to treat people with anxiety disorders. The practice has received lots of attention recently across universities and hospitals, even though the meditation has been around for centuries. Essential Oils – Using essential oils throughout the day at times when you feel stressed can help ease your anxiety. Lavender oil has been shown to reduce anxiety and help calm the mind. Using lavender oil can also be beneficial at night because it calms and relaxes the body. It comes in various forms like a spray bottle or glass container. You can lather the oil in your hands, and rub it on your neck and chest. Or you can place a few drops in an oil diffuser at work or in your room. They are accessible at grocery stores like Whole Foods and of course Amazon. Find out the root cause of the anxiety you are feeling. If a job is creating stress and anxiety it is important to find a way to relieve your mind when you encounter the stressful situations on the job. If matters get worse, then find another job. Jobs are everywhere and stress shouldn’t be a factor. For those who are experiencing social anxiety disorder, make sure to practice mindful meditation. It is the practice of paying attention to what is inside and outside of you. A situation that might occur is if you are having a social anxiety attack, first you need to acknowledge it, and then you need to find a way to calm your nerves. Be mindful of how your body is reacting to the situation. I know it sounds easier than it sounds, but like everything else it takes practice. Make sure to take matters into your own hands, if you are experiencing any of the symptoms above it is your responsibility to see a doctor and find out more information on how to best handle the disorder.